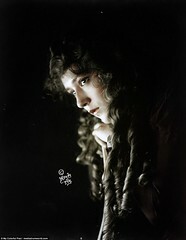 As the opera house gawks at the Countess (Pina Menichelli) in her v.i.p. box, it seems she is receiving their adulation with arms wide — but, no. She is only having her fur wrap removed while waiting for the curtain to open. “Tigre Reale” (“Royal Tigress”), Itala Film 1916; dir. Giovanni Pastrone. BELOW: The curtain rises. “The Italian film diva is both the movie’s center and the movie itself; she is the eye and the hurricane. . . we bathe in her fragrant mysticisms and sensualities, while all about her, rent hearts and havoc are strewn with the violence of Armageddon. Even she is consumed by the force of her own storm — babies are ripped from her arms, leering roadmen are thrust into their place. She is buffeted by betrayals. Her purses are torn away. Savagely lashed by her own tresses while Destiny blasts her soul, the diva cries out for vengeance, cries out with her entire body, . . expressing wave upon wave of inner tumult.” Guy Maddin, “Silent Divas of the Italian Cinema,” Foreword to “Diva: Defiance and Passion in Early Italian Cinema,” by Angela Dalle Vacche. The diva as a concept arises with the support of popular late 19th century western philosophy which posits the existence of human ability to create, to reinvent, to overcome — a life force that allows one to shape ones own destiny no matter what the obstacles. But for women, this concept clashed not only with centuries of patriarchy, but also with contemporary writings of Italian criminal anthropology — that women were biologically inferior and limited without recourse to be either a mother or a prostitute and a criminal. The Catholic church offered women its own form of spiritual redemption, but small consolation: to suffer as mothers suffering for Christ — the mater dolorosa. 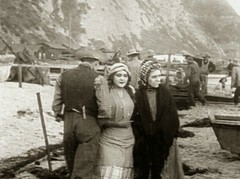 Out of this clash of cultural concepts, the woman of early Italian cinema became the film icon, “diva.” The stories of these women, of diva film, are the stories of their struggles, strivings, failures, successes, loves, illnesses, obsessions with material objects, their ability to accept, or not, the destruction caused by time: age and death. 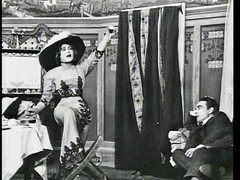 Between the nineteenth century operatic stage and the twentieth century cinema screen, the diva made a “strange detour through the ancient form of the commedia dell’arte — a theatrical institution that enabled women to refashion their own image in the new industry [with] new roles and profession[s].” [Dalle Vacche, “Diva.“] In the commedia dell’arte, lead actors and actresses could become “artistic directors” in the theater, and this carried over to the early Italian film production companies. (Lyda Borelli and Pina Menichelli both served “apprenticeships” in theater companies headed by women, and they, along with Francesca Bertini, would later form film production companies.) Thus, the new century finds them working in a new art form and in an industry in which women have positioned themselves for leadership, in image, and in fact. Emblematic of this is the short film comedy, Una tragedia al cinematografo (“A Tragedy at the Movies”), a 566 foot, 5 minute satire on jealous husbands of “independent” wives who frequent the cinema in the afternoons while their husbands are toiling away at work. 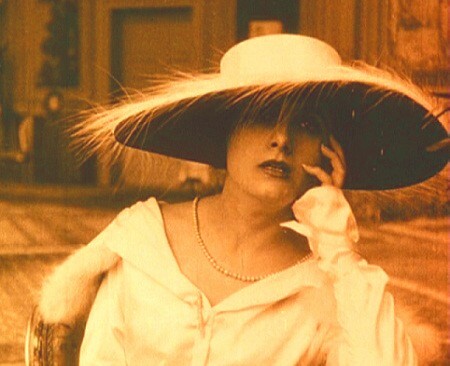 The film was recently discovered in its entirety in the Netherlands with Dutch intertitles as, “Een Treurspel in de bioscoop.” Pina Menichelli plays the independent wife. Her husband Anthony is jealous and suspicious of his wife and the spies on her constantly. Pina Menichelli is the independent wife of a wealthy businessman who fears his wife is a little too independent: he follows her as she makes her rounds shopping at expensive boutiques. Una tragedia al cinematografo (“A Tragedy at the Movies”), Cines, S.A., 1913; dir. Enrico Guazzoni. BELOW: She surprises him at the office, on her way alone to the movies. But he is suspicious . . .
One day he follows her out onto the street and sees her walking down the sidewalk apparently with another man. He follows them and believes they have entered the cinema on the corner (instead they each went their separate ways, neither to the cinema). Blinded by suspicion, Anthony wants to enter the cinema. The manager stops him outside, then goes into his theater and turns on the lights, warning his patrons: “Dear lord, a husband is waiting outside for his unfaithful wife to leave to kill her. I pray those of you who do not have a clear conscience to leave via the emergency exit!” In an instant, all the patrons in the theater were gone. At the end of the film, in front of the theater, parading past the husband, there are only men, the wives having “safely” exited through the rear doors of the theater. Do all the women feel guilty, and about what — their independence? Or do they fear that the men in their lives are overbearing, even crazy-jealous? Sort of a cultural clash in miniature, is how this little tale strikes me. As 1914 drew to a close, armed conflict, though not yet spread into a world war, had enveloped much of the European continent. (Italy would be spared the worst of the fighting until 1917.) Reports circulating in the motion picture press in the fall of 1914 that Italian companies Cines and Celio would relocate their core assets to safe havens in Monaco and Brazil proved not premature, just wrong. In fact, the American distributor for Cines and Celio films, George Kleine, decided to get his hands dirty and get his firm directly into the business of film production themselves — but not in America, in Italy! 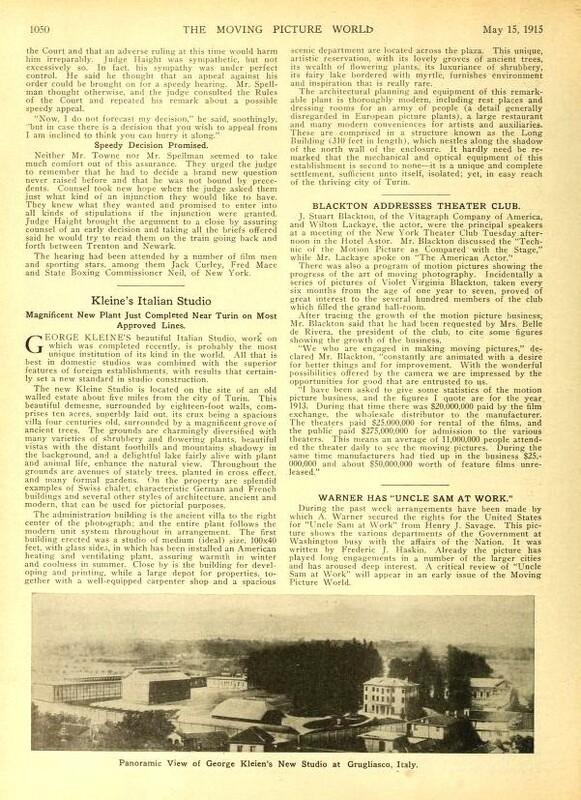 Only six months earlier George Kleine had posted a note in The Moving Picture World asking that people stop sending him screenplays because Kleine was an importer and distributor of films and did not produce any films in America. Kleine had now built a large, well-equipped film studio in Tuscany — complete with a huge, American-style cafeteria and spacious dressing rooms for the actors — less than six months after hostilities began. And then got cold feet. Within a few weeks Kleine admitted that the new studio and facilities in Italy would be mothballed until the “conditions” on the continent had improved. But Kleine had hedged his bets on film production — he had in the meantime acquired the old studio facilities of the American Mutoscope and Biograph Company at 11 East Fourteenth Street in Manhattan (Biograph had moved out to the “country” — the Bronx), and was busy churning out American made “feature”-length films, dramas and comedies, for distribution in America, and to a country that had a deficit of film product, a product it had previously imported from Germany and the Continent before the war began, Great Britain. Pina Menichelli was born Giuseppa Iolanda Menichelli in 1890, in the village of Castroreale, Messina, in Sicily, the second child in a family of actors. Her mother Francisca had taken up the profession after watching her own older brother, Pina’s uncle, defy their parents who wanted him to follow the intellectual path of his uncle Don Gioacchino Ventura, an academic, an author and lecturer on politics and philosophy. The youngest generation, Pina and her three siblings, all joined their parents onstage from earliest childhood — in the footlights whenever a baby or small child was required. Pina and older sister Lilla both received a secondary education in Bologna, which ultimately did nothing to discourage either from following their parents in the performing arts. Young Pina’s first important break came when she was seventeen: her admission to the acting company of Irma Gramatica who in her thirties was already considered among the most important actors of the Italian stage. With the Gramatica company, Menichelli gained her first notices in the press, and extensive touring that took her to Argentina and Buenos Aires where she met and married her first husband, an expatriate Neapolitan journalist. At this point, Menichelli took a detour from her acting career. She remained in Argentina and in 1909 bore her first child who died soon afterward, then a healthy second child born a year later. She stayed in Argentina with a failing marriage until 1912 when, again pregnant, she left her husband to return to Italy and gave birth to her third child in Milan that year. 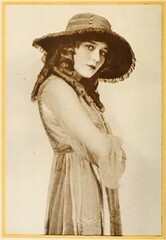 By early 1915, Menichelli was attracting major notice in the Italian film press. Although her performances showed she had great promise , in particular Alla deriva (“Adrift“) and Sottomarino n.27 (“Submarine No. 27“), she was accused of “Borellisimo” and “Bertiniagge,” in other words, of imitating the acting styles of Lyda Borelli — “Borelli-isms” and Francesca Bertini — “Bertini-sian.” Italian film historian Vittorio Martinelli notes that her last scene in “Adrift” was “marred by an attitude of slouching her head, suddenly, like Borelli.” And although the action adventure tale “Submarine No. 27” (possibly the first submarine war film?) in particular was a huge success, this and many of the other films did not give Menichelli the opportunity to do much more than be the beautiful love interest, not central to the stories. 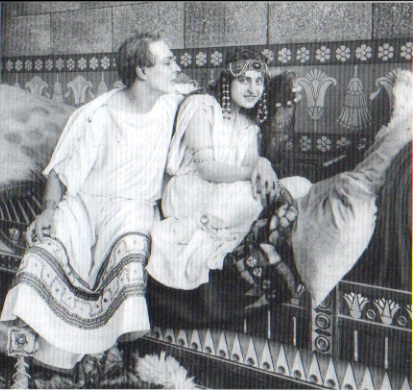 Menichelli’s big break should have come in late 1914 with the release of Enrico Guazzoni’s major production of Julius Caesar for Cines. She was cast as Cleopatra. But after filming had finished, during the final edit there was a major change in the film’s narrative and the part of Cleo was cut completely. But, in a fortuitous twist of fate, she got her big break anyhow — as the result of her performance in a small role in another Cines production directed by Guazzoni, For Napoleon and France, in which Menichelli played a French drummer girl who sacrifices her life for country. When the top director at Itala-Film studios in Turin screened the film, he was fascinated by Menichelli. Legend has it that Giovanni Pastrone stopped the projector, pulled out the film and cut out a frame of Menichelli, handed it to his assistants and demanded that they head for Rome immediately, find this actress and offer her a contract. They did, and she signed. 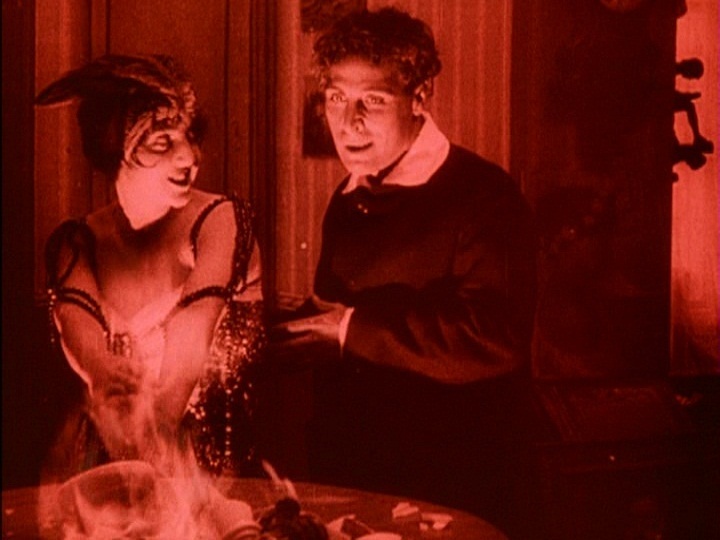 Il fuoco (The Fire) was the first film directed by Giovanni Pastrone after Cabiria (excluding the Cabiria spin-off, Marvelous Maciste, rushed into production to capitalize on the unprecedented popularity of Cabiria and the character of “Maciste,” particularly in the U.S). Pastrone had achieved in Cabiria a level of international success never before witnessed in the young art of motion pictures, not even by Griffith. 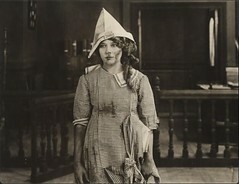 (Birth of a Nation was being filmed in America during roughly the same period as Cabiria and “Maciste” in Italy, though not released until late in 1915.) And with Cabiria, Itala Film of Turin had vaulted ahead of its older Roman rival, Cines. Pina Menichelli must have felt that she was making the correct decision in leaving Cines, her first film home. She had contributed to forty films at Cines only to have her “Cleopatra” of Julius Caesar left on the cutting room floor in her biggest career opportunity to date. But her first project with Itala, Il fuoco, would prove anything but a safe, conservative career move for Menichelli, or Giovanni Pastrone. Il fuoco is based upon a novel by Gabriele D’Annunzio, the Italian poet and prose artist whose career would take a hard right turn in the next few years as he became a spiritual leader of Italy’s fascist movement with his black-shirt goon squads. But for now, it was his art that mattered and Pastrone thought enough of it to make it his follow-up to Cabiria. But Il fuoco could not count on its appeal with Italian nationalism and monumental past, as had Cabiria. Instead it would be sold the only way it possibly could: as an art film, and one with no small amount of artifice. A simple plot synopsis makes this obvious. Two artists — an enigmatic poetess and a painter — meet by chance in a wooded marsh. The painter, intrigued, looks forward to seeing her the next time he comes to this swamp — but the next time she is distant and cold; yet she leaves behind (what he takes to be) a note or a poem to him. She later appears to him in his room, and literally sparks fly and a flame ignites along with their passion. Needless to say, the affair is brief and doomed. She invites him to her estate and castle, also home to an owl, who the poetess seems to resemble with her owl-like headdress. The artist loses his love and his mind in the process. It is an art film. And this is how it was marketed to the Italian public. Most importantly, this is how it was presented to the censors and the Roman Catholic Church, but not until after it was first rejected by the censors and condemned by Church officials. As might be expected, the controversy over Il fuoco only increased interest in the film. It proved the unique talent of Pastrone was not dependent upon grand spectacle, that he could follow an epic success with a successful, small art film. At any rate the day of the epic film was now done. War films, with war nearly in their own back yards, were not going to be where Italian films were headed for the next few years. For Menichelli, the film opened new horizons and a new public persona. She was now a star, a diva, but more: a diva with a darker image that, whether she liked it or not, would grow even more intense with Pastrone’s next film. It would be another “art film,” but not as small — and far more disturbing than Il fuoco. It would be a film that would have audiences comparing Pina Menichelli no longer to Borelli or Bertini or anyone else, Tigre Reale. Dalle Vacche, Angela, Diva: Defiance and Passion in Early Italian Cinema, University of Texas Press (2008, Paperback, with DVD, “Diva Dolorosa,” (Filmmuseum Netherlands)/VPRO, 1999, Dir: Peter Delpeut). Brunetta, Gian Piero, The History of Italian Cinema, Princeton University Press (2009, paperback). Martinelli, Vittorio, Pina Menichelli, Le sfumature del fascino, Bulzoni Editore, Rome, 2002. Softcover. 130pp. In Italian. Many B&W photos. The best published source for information on the life and career of Menichelli, but you’ll have to be able to read Italian or be patient enough to translate with Google to use the text. Detailed filmography is extremely useful. And the photos are fantastic, most of which I’d never seen before. You shouldn’t have any trouble locating a copy in the U. S. through one of the major book listings — I recommend you start your search in bookfinder.com — without having to purchase overseas and pay for overseas shipping. An excellent, annotated biographical sketch of the life and career of Pina Menichelli, with an extensive bibliography and a complete, accurate filmography, may be found in an updated article on Wikipedia, at http://en.wikipedia.org/wiki/Pina_Menichelli.